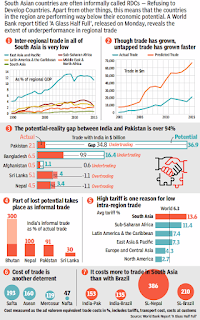 Deeper regional trade and connectivity has the potential to more than triple India’s trade with its south Asian neighbours, the World Bank said in a report. 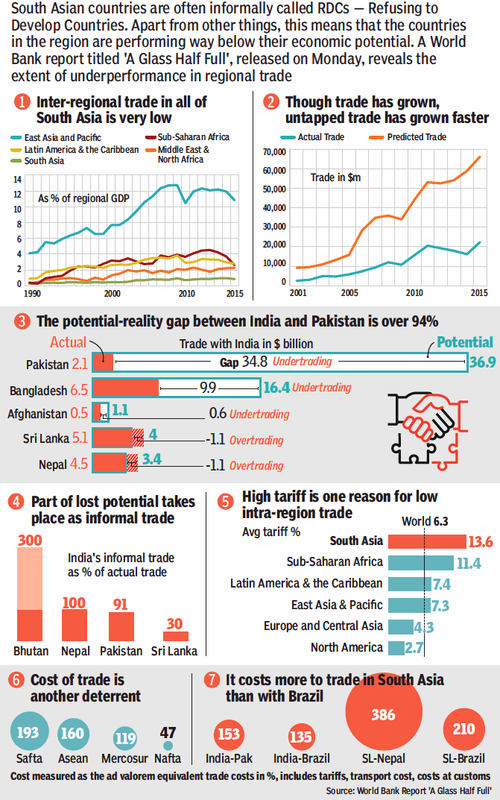 In the report titled ‘A Glass Half Full: The Promise of Regional Trade in South Asia’, the bank estimates India’s potential trade in goods with south Asia at $62 billion, against its actual trade of $19 billion, which is a mere 3% of its global trade and about $43 billion below its potential. “Deeper regional trade and connectivity can reduce the isolation of northeast India, give Indian firms better access to markets in south Asia and east Asia, and allow it to substitute fossil fuels with cleaner hydropower from Nepal and Bhutan,” the bank said in the report. Trade between India and Pakistan is valued at $2 billion but can reach $37 billion without trade barriers, according to the report. “Given the context of South Asia, an incremental approach toward deeper trade cooperation can be very powerful, and the region has witnessed examples of this in the form of India-Sri Lanka air services liberalisation and India-Bangladesh border haats,” said Sanjay Kathuria, lead author of the report and lead economist at World Bank.